Viewing a thread - Anyone know this 57 Dodge Convertible? Anyone know this 57 Dodge Convertible? Subject: Anyone know this 57 Dodge Convertible? This 1957 Dodge Custom Royal Lancer Convertible has real presence on the road and proved to be a legitimate affordable alternative to many pricier competitors in its period. 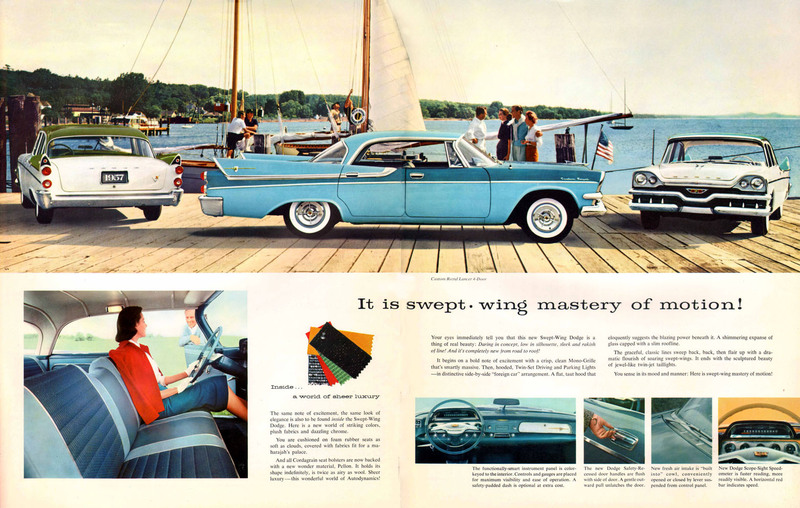 Having nearly been swallowed up by bankruptcy in the earlier part of the 1950s and armed with a $250 million loan from Prudential, the Chrysler Corporation stepped it up in 1955 with striking new designs and tremendously well-packaged vehicles. In 1956, the offerings got even better, and the Custom Royal Lancer was introduced as the top-of-the-line model from Dodge. CRLs, as enthusiasts often refer to them as, were a major leap for Dodge, offering amenities and styling efforts seldom or never before seen on a Dodge vehicle. With Chrysler introducing hugely restyled vehicles for 1957, the Dodge CRL became truly glitzy, letting everyone know it was the division’s best. Advertising of the day proclaimed, “Swept-Wing is Sweeping the Country,” indicating the long, tall, futuristically finned rear fenders. Dodge offered the Custom Royal Lancer in convertible, sedan and hardtop coupe with pillarless-roof styling, upstaging a number of competitor cars with a price tag that reflected a lot of value. This Custom Royal Lancer convertible is powered by a 325 CI V-8 engine with a 4-barrel carburetor and an automatic transmission controlled by pushbuttons on the dashboard, a trademark Chrysler Corporation feature that illustrated the company’s interest in producing technologically advanced, futuristic vehicles. Presented in black with a black and red interior, this CRL is exemplary of Dodge’s idea of a top-drawer car. The convertible top is power operated, as are the steering, brakes, windows and bench seat; it’s also equipped with a radio connected to twin aerials upon the rear deck. The dual exhaust allows an unobtrusive but authoritative note, and the spinner-style hubcaps are affixed to steel wheels wrapped with whitewall tires. The brightwork gleams effortlessly upon the deeply reflective black paint and, all things told, this 1957 Dodge Custom Royal Lancer Convertible is an exciting example of Dodge’s most luxurious offering for the era. Subject: RE: Anyone know this 57 Dodge Convertible? It's a beauty. It would be great to see a pic of the data plate, although the build card would be the best document. Same colors, same rather high front end, same exhaust ends, power windows and seat. Location: Lower Mainland BC Interesting that there is absolutely no mention of "D500" in the text (other than mention of the 325 hemi), yet the engine bay and trunk badge both spell it. Nice engine bay. Looks correct to me, even has the proper D500 oval air cleaner (a fact that I missed on another restored 57 D500 back in 2016). Reading through that thread, I hate that Neil is gone. Being a D500 owner (albeit 56), I would have like to have had Neil around to answer my questions so, yes, I hate that he is gone. What bothers me more though is the info that he had was not in a form that could have been shared and saved, i.e. passed along to somebody - maybe like LD3Greg. Instead, it disappeared with Neils passing. Neil had a wealth of information. He decoded any '57-59 Dodge data plate and build card copy I sent him, and gave lots of suggestions about restoring a car correctly. At one time he estimated that there were probably 10 '57 D500 convertibles left in existence, and we talked a lot about the D501 convertible I considered purchasing. I sure miss him. Location: Victoria, BC, on Vancouver Island, Canada Nice but the upholstery cloth is incorrect. The cloth material in this car is 1958 Custom Royal material. The inserts should also have horizontal pleats. This one below, in blue, is correct for a 57 Custom Royal. Location: Victoria, BC, on Vancouver Island, Canada Better yet, here's a red interior, all original showing correctly. Anyone know who owns it? no, maybe check on mecum? email? Location: Whetstone, Arizona Here's my list of what i see wrong with this restoration,.....the Speedo has been swapped out for a 58 unit,....Label on the air cleaner is incorrect...it should be placed in top,...... Its missing the spark plug cable holders....Plus what others have said...the interior is also incorrect..black vinyl on the door panels where it should be black/gold cloth...seats done in 58 cloth....lower front valance is wrong...it should be in silver...The Lancer badges on the quarters are facing the wrong way...brake pedal is wrong (Desoto? )...lower half of the dash painted black....steering wheel painted too bright a white, it should be a ivory color.......Missing the Exhaust deflectors!...... they blacked out the chrome knobs centers on the dash...I'd want to see the data plate before anything was bought or paid for. Location: Ontario, Canada Post a pic of the body plate and I will decode it just like Neil and I did for any 57 Dodge. Those body plate codes were absolutely unique for 57 Dodge only. That is what separates the men from the boys for these cars. When it comes to big buck 57's, have any of you noticed that NEVER the punch card AND the body plate were ever offered TOGETHER as proof of legitimacy!!! The problem, of course, for the "restorer" is that he can't fudge the body plate because he doesn't know the codes. Anyone still wonder why I won't publish them?!! Well someone spent a whole bunch grocery money on that car and it is very nice indeed. However to that and I am no expert on a '57 Dodge Dodge Royal Lancer Convertible, black. However I agree with the other posts as to what is not correct. Reason being my aunt and uncle owned they bought brand new and had it untill the day they both had passed. It looked so cool sitting next to an Imperial convertibale Indy baged pace car. I know where the car is still today and it is completely original. Also not for sale in the next few coming centuries either.